Built in visual and audible low level anti-theft alarm.Monitors volume of useable heating oil remaining.Monitors room temperature.Monitors fuel level.Records heating oil consumption in litres.Estimates heating oil costs in sterling or euro.Can be fitted to almost any oil tank up to 150m from the receiver unit.Incorporates a unique ‘days to empty’ facility. Apollo Smart is the world’s first heating oil energy monitor now with inbuilt Fuel Theft Alarm. Unlike traditional oil tank contents gauges, Apollo Smart allows you to monitor the volume of useable fuel remaining inside your tank, heating oil consumption, energy costs, air temperature and carbon emissions – from the warmth, comfort and convenience of your home. Measuring key indicators of system efficiency helps you to identify interventions to reduce heating oil consumption, energy costs and carbon emissions. 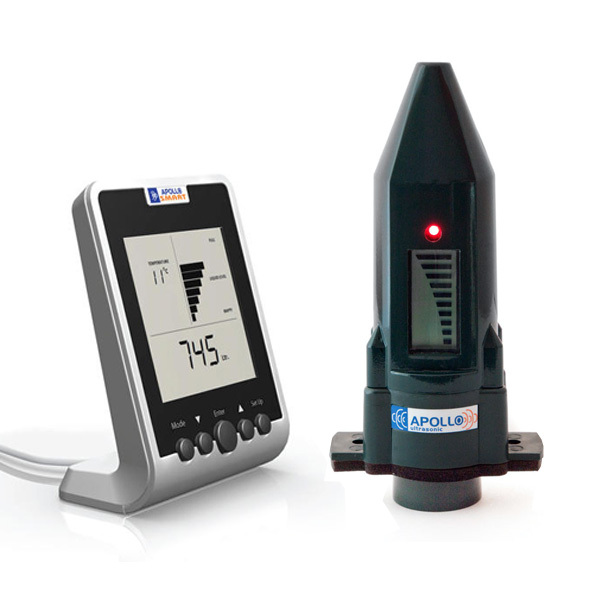 Apollo Smart Oil Monitor is a two-piece system, which comprises a tank top transmitter unit and a receiver unit. The wireless transmitter unit is suitable for use with almost any oil tank up to 3 metres tall, irrespective of manufacturer or material of construction. The receiver unit incorporates a premium quality LCD display and simply plugs into a standard electrical socket, with no wiring or electrical work required. The receiver unit also incorporates a unique ‘days to empty’ facility, which shows you how many days supply of fuel remains. The risk of running out of oil is further reduced by an inbuilt low level alert with audible warning alarm.